A brand new model and a seriously upgraded second one are set to bring extra street cred to the Yamaha range, with the launch of the new MT-09SP and upgraded MT-07, with the latter also available as a learner approved (LAMS) bike. For 2018, the MT-07 features a completely new body design to enhance its appearance, new style air intakes and a redesigned front headlight. It’s also borrowed the MT-09’s rear light. A revised seat shape improves riding position, while sportier front forks and a rear shock with rebound damping adjuster have also been added. It’s available as a full spec 689cc HO model or 655cc LA learner approved model, with both featuring a liquid-cooled, inline twin cylinder 4-stroke, with a 270-degree crank and linear torque output. Both variants are built on a slim and compact tubular backbone frame, making it agile, manoeuvrable and easy to handle. It rides on lightweight 10-spoke cast aluminium wheels, has digital instrumentation with full LED display, and boasts dual 282mm front discs with 4-pot calliper. The LA model is available in Tech Black, Night Fluo (pictured) and Yamaha Blue. The HO model comes in Tech Black only. Both bikes come with a 24-month warranty, with the LA model available for $9,999 and the HO version priced at $10,699. Prices are plus on-roads. 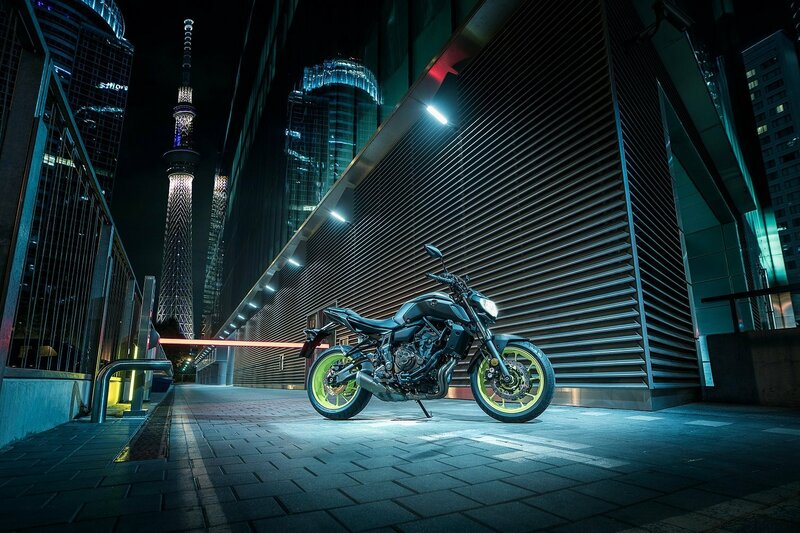 Its partner in crime is the new MT-09SP, which features a high standard specification that includes Öhlins equipment as well as dedicated colouring and unique finishing, with the radical new ride building on the significant strengths of the MT brand. It features fully adjustable Kayaba front forks with rebound and compression damping, class-leading handling and performance from the torque-rich CP3 847cc (115hp) 3-cylinder cross-plane engine and a quick shift system for clutch-less upshifts. Mechanically, there’s an assist and slipper clutch, D-MODE adjustable engine character and switchable traction control system, all on a lightweight aluminium frame and swing arm, with aggressive LED twin-eye headlights. It comes in just one colour, an exclusive MT-10SP inspired Silver Blu Carbon paint scheme, with blue stitched seams on seat and blue wheels with SP graphics, along with black handlebar controls and instruments. It also features a swing arm mounted licence plate holder and LED position lights, and like the MT-07 models, it comes with a 24-month warranty, and hits the road at $13,499, plus on-roads.